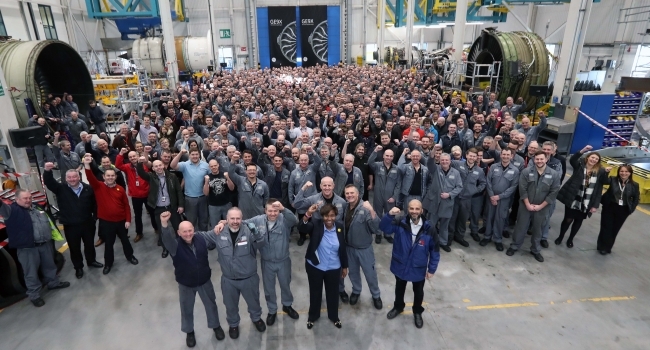 GE Aviation have announced the selection of its Wales site as the GE Maintenance Repair and Overhaul (MRO) facility for the GE9X, the world’s largest and most fuel-efficient jet engine. The Nantgarw overhaul facility, based just north of Cardiff, has been chosen to lead the company’s global ‘Entry into Service’ readiness programme. GE Aviation Wales was selected based on its wealth of technical expertise and its track record of continuous improvement. The site, which employs more than 1,400 people, will also benefit from a £5m investment from the Welsh Government to help towards the total £20m investment, over the next 5 years to equip and upskill the facility to be ready to maintain the GE9X fleet when it enters service on the Boeing 777X. • The GE9X can generate 100,000 pounds of thrust. • Its front fan is 134 inches in diameter (3.35 meters), which is a world record. It has a bypass ratio of over 10:1. • The engine includes just 16 fourth-generation carbon-fiber wide chord fan blades for improved aero efficiency. • The GE9X offers 10% better fuel burn than the GE90. • The engine has 3D printed fuel nozzles. • The combustor and the turbine shrouds and nozzles incorporate lightweight and ultra-heat-resistant materials called ceramic matrix composites (CMCs). • CMCs can operate at temperatures of up to 2,400 degrees Fahrenheit and are lighter and require less cooling flow than conventional high-temperature metals. 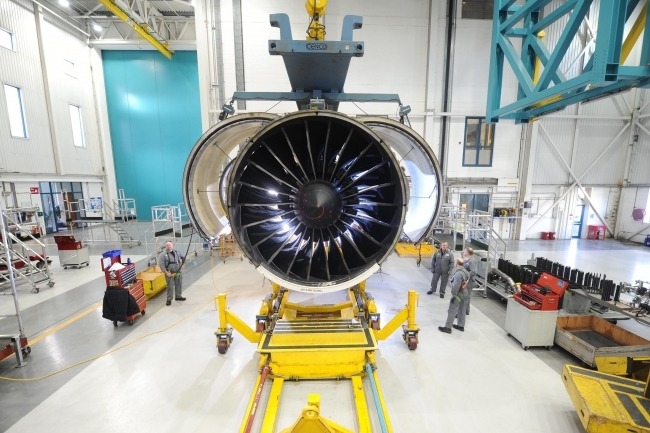 GE Aviation Wales specialises in the maintenance, repair and overhaul of a range of commercial jet engines. The facility, based in Nantgarw, just north of Cardiff, occupies over 1.2 million square foot of workshop space and has two state-of-the-art engine test facilities. They have over 1,400 employees including ~70 Apprentices and ~40 Interns, making it the 2nd largest company in Wales and the largest industrial company in Wales. It is one of the largest aircraft engine maintenance facilities in the world, the business has capabilities to handle more than 500 engines a year and works with over 90 customers worldwide.